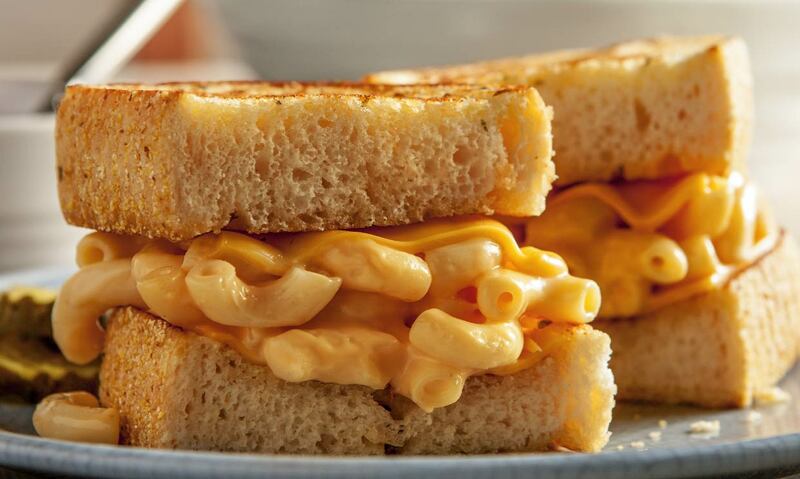 In just ten minutes of cook time with our Macaroni & Cheese, you can create a sandwich that will blow your taste buds away with rich and hearty flavor, made for kids and adults. Place 4 slices of garlic bread in a large non-stick skillet over medium low heat. Heat bread slices for 3 minutes and flip over to evenly warm through. 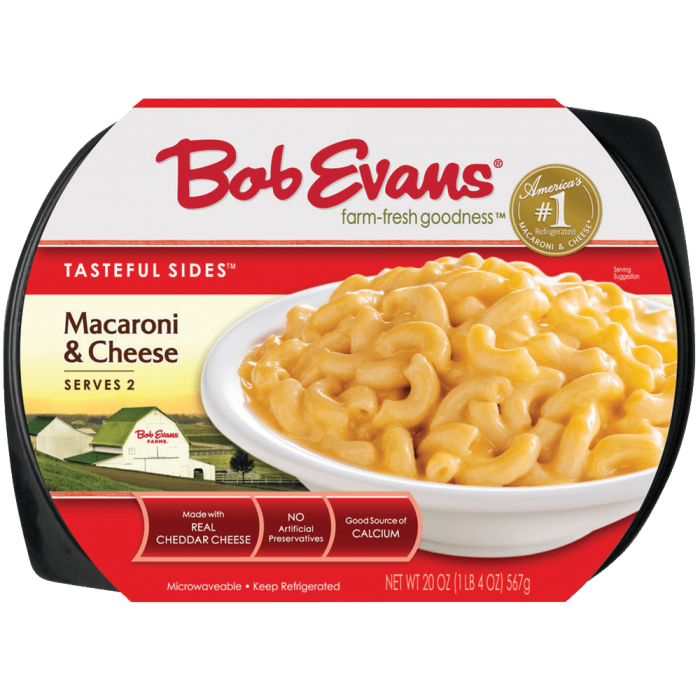 Remove overwrap and vent Bob Evans Macaroni and Cheese. Place Bob Evans Macaroni and Cheese in the microwave and heat for 3 minutes on High. Place ½ slice of cheddar cheese per piece of garlic bread. On 2 pieces of garlic bread, evenly spoon 4 ounces (about ½ cup) of macaroni and cheese on top of cheddar cheese/garlic bread slices. Place the remaining 2 slices of garlic bread on top of the macaroni and cheese stack. Toast both sides for an additional 2 minutes or until bread is toasty brown and cheese is melted. Serve with dill pickle chips and tomato soup for dipping. 1 Place 4 slices of garlic bread in a large non-stick skillet over medium low heat. 2 Heat bread slices for 3 minutes and flip over to evenly warm through. 3 Remove overwrap and vent Bob Evans Macaroni and Cheese. 4 Place Bob Evans Macaroni and Cheese in the microwave and heat for 3 minutes on High. 5 Place ½ slice of cheddar cheese per piece of garlic bread. 6 On 2 pieces of garlic bread, evenly spoon 4 ounces (about ½ cup) of macaroni and cheese on top of cheddar cheese/garlic bread slices. 7 Place the remaining 2 slices of garlic bread on top of the macaroni and cheese stack. 8 Toast both sides for an additional 2 minutes or until bread is toasty brown and cheese is melted. 9 Serve with dill pickle chips and tomato soup for dipping.